Asphalt is essentially a paving material that is made with stone aggregates, water & bitumen- which is a very sticky variant of petroleum. 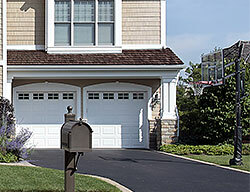 There was a time when it was very popularly used in driveways as it was a highly durable and cost-effective material. Though its durability is not in question today, the cost of any blacktop driveway that has some form of oil is now significantly higher. In addition to this, the fact that concrete is now more popularly used in landscaping has pushed asphalt a bit into the shadows in residential and commercial applications. One more impacting factor is that a number of people hold a very common misconception- that when it comes to using asphalt in their landscaping; boring black is the only option they have. The truth of the matter is that this material is versatile and offers quite a few decorative options, which still makes it in ideal material for driveways etc. 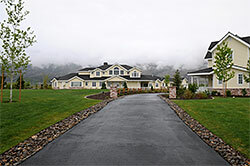 Tar & Chip Driveways - This is another option that looks akin to gravel, but has the strength and durability of asphalt. The tar &chip option is essentially asphalt with stone aggregate that has been seeded into its surface. This kind of a driveway looks much more natural & lighter than standard asphalt. What is notable is that this material also provides very good traction (but snow removal can be a task). In addition, since its surface does not require sealing, installation costs are lower. And so, do not let the traditional perception of this material deter you from using it in your landscaping projects. California Creations offers full-service landscape solutions and can give you the kind of asphalt driveway you want in and around San Fernando, Santa Clarita, Simi Valley. We are the landscapers of choice in the region who focus on quality and maintain realistic pricing. If you need any more information about our services, feel free to use this online form or contact us on 818-083-1213.